What salmon habitat issues worry fishermen? What's the best way to talk about them? That's what the state's largest fishing organization is trying to find out. The United Fishermen of Alaska is working on a project to figure out what issues the salmon fleet is concerned about – and how to reach them. UFA's Lindsey Bloom said the goal is two-fold: figure out what issues most concern the fleet, and how they want to reach them. “Our goal is to get more efficient as a committee, to get more efficient as an organization, to help consolidate information, to ensure that salmon fishermen in Alaska are as informed as they want to be about what’s happening with salmon habitat, and then our hunch is that they will then be engaged with decision-makers about what’s happening," she said. The project developed as UFA board members noticed just how overwhelming the wide-range of salmon habitat concerns and information can be. "To get your head, as a fisherman, around OK – how is ocean acidification impacting salmon? How is climate change impacting salmon? How are projects in my local watershed going to impact salmon? And if I have concerns about that, where do I have an opportunity to speak and voice a concern? There’s just so much coming at us in such a quickly changing world, that we are hoping that we can help consolidate information, distill it down, and present it and provide it to a fishermen in a way that’s more tangible and less overwhelming," she said. To find that more tangible, less overwhelming way of presenting information, the group is digging down on communication. 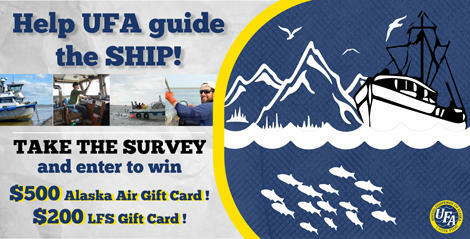 To gather all that information, there’s a survey online at UFAfish.org.